xviii, 206 p. ; 24 cm. Reveals the master plan behind Apple&apos;s revolutionary business model, the secrets and management principles that keep Apple far ahead of the business curve. 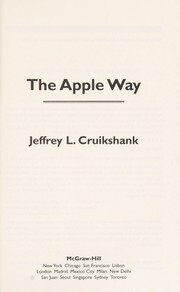 The Apple way / by Jeffrey L. Cruikshank. 100 Personl Name ME 1 $a Personal name Cruikshank, Jeffrey L.
$c Statement of responsibility by Jeffrey L. Cruikshank. 500 General Note $a General note "12 management lessons from the world&apos;s most innovative company"--Spine. 504 BibliogEtcNote $a Bibliography, etc. note Includes bibliographical references (p. 179-193) and index. 520 Summary Etc. $a Summary, etc. note Reveals the master plan behind Apple&apos;s revolutionary business model, the secrets and management principles that keep Apple far ahead of the business curve. 610 AE:CorpName 20 $a Name Apple Computer, Inc.